Bidding for a third successive title in Europe's elite club competition, Real paid a heavy price for not winning its group as it was drawn with the big-spending Parisians. 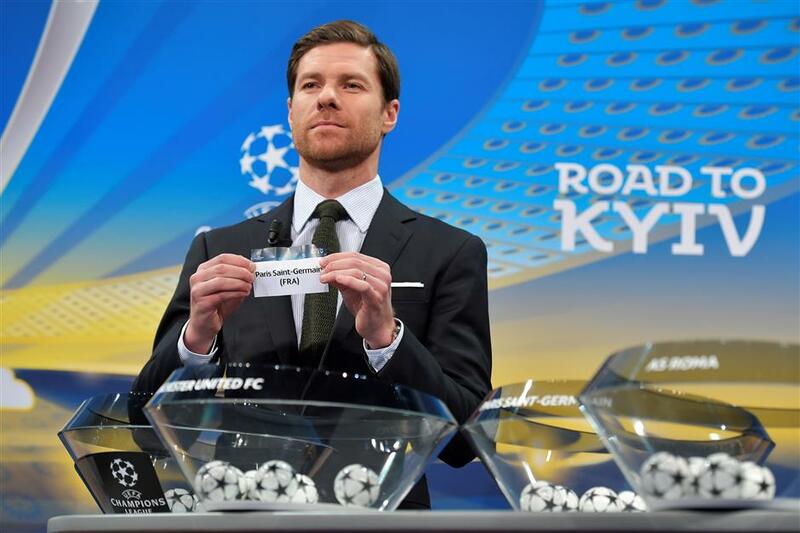 Former Spain international Xabi Alonso shows the slip of Paris Saint-Germain during the draw for the last 16 of the UEFA Champions League at the UEFA headquarters in Nyon, Switzerland, on December 11, 2017. Holder Real Madrid will have to overcome a sizable obstacle when the UEFA Champions League resumes in February after Monday's draw pitted the 12-time winner against Paris Saint-Germain. Bidding for a third successive title in Europe's elite club competition, Real paid a heavy price for not winning its group as it was drawn with the big-spending Parisians who were tipped as many people's favorites ahead of the draw in Nyon. Five-time champion Barcelona will face English champion Chelsea, one of five English Premier League clubs in the draw. Tottenham Hotspur, which topped its group ahead of Real thanks to a 3-1 victory at Wembley, will face Serie A champion and last season's runner-up Juventus. Manchester City, which clocked up a record 14th successive EPL victory on Sunday, is now listed as the favorite after being handed a last-16 clash with Swiss club Basel. Five-time winner Bayern Munich, which finished below PSG in the group, will be happy with a two-legged clash with Turkish outsider Besiktas. Europa League champion Manchester United takes on Sevilla, Liverpool will meet Porto and AS Roma's reward for winning its group ahead of Chelsea is a tricky tie against Ukraine's Shakhtar Donetsk. The UCL has proved beyond even the vast riches available to PSG and last season it was stunned in the last 16 by Barcelona, losing the second leg 1-6 after beating the Spanish side 4-0 in the French capital. A clash with Real is hardly what it would have desired at such an early stage but with Neymar and Edinson Cavani having scored six goals apiece in the group, the Parisians will be hopeful — if they can keep Real's nine-goal Cristiano Ronaldo quiet. "This could have been the final, given the power of the two clubs. The last 16 is a bit early, we could say. Logically, we are both challengers for the trophy," Emilio Butragueno, Real's director of institutional relations, said. "I don't think it's a good draw for them either. It will be a thrilling tie." PSG and Real have played six times in Europe, most recently in the 2015-16 group stage when the sides drew 0-0 in Paris and the Spanish side edging the return match 1-0. Chelsea and Barcelona will renew a regular UCL rivalry that last surfaced in the 2012 semifinal when Chelsea won 3-2 on aggregate before going on to claim the trophy for the only time in its history. Barcelona won the 2009 semifinal on away goals, Andres Iniesta breaking Chelsea's hearts with a 93rd-minute decider. "We've had some great times at Stamford Bridge, haven't we?" Barcelona said on Twitter. Chelsea boss Antonio Conte said past events were of no consequence. "Our reaction must be positive. The past is the past, the present is another story," he said. The other English qualifiers fared better, especially City. While Basel is a formidable side at home and has taken big English scalps in the UCL before, Pep Guardiola's side will be a firm favorite to progress. "We have to be careful, they deserve to be here," City's technical director Txiki Begiristain said. Tottenham will face Juventus for the first time while United and Sevilla have also never met before. Bayern will face Besiktas for the first time since winning 2-0 home and away in the 1997-98 group stage. "Bayern is a powerful team but we are not a piece of cake either," Besiktas president Fikret Orman said. The first legs, with group winners PSG, Tottenham, Liverpool, United, Roma, City, Barcelona and Besiktas away first, take place on February 13-14 and February 20-21 with the returns on March 6-7 and March 13-14. Meanwhile, Italian club Napoli will face German high-flyer RB Leipzig in the pick of the Europa League last-32 ties following the draw on Monday. Both sides are second in their domestic championships having dropped into the Europa League after finishing third in their UCL groups. The other sides entering the Europa League at the first knockout stage after failing to make the last 16 of the UCL are Borussia Dortmund, Atletico Madrid, Spartak Moscow, Celtic, CSKA Moscow and Sporting Lisbon. In another Italian-German tie Atalanta will face Dortmund. Atletico, twice UCL runner-up, will take on FC Copenhagen which crept into the knockout stage. Red Star Belgrade's first post-Christmas European action in 26 years earned it a tie against CSKA. Scottish champion Celtic will have its work cut out against Roberto Mancini's Zenit St Petersburg. Former European champion Steaua Bucharest faces Lazio and Olympique Lyonnais plays Villarreal. Arsenal, which missed out on the UCL for the first time in 20 years, continues its Thursday night adventures against Sweden's Ostersunds.